Blue-green algae, also known as cyanophytes or Cyanobacteria are photosynthetic and essentially aquatic prokaryotic organisms closely related to bacteria. They are found almost everywhere, but are most common in marine and freshwater habitats, in damp terrestrial habitats, and sometimes in association with fungi to form lichens. 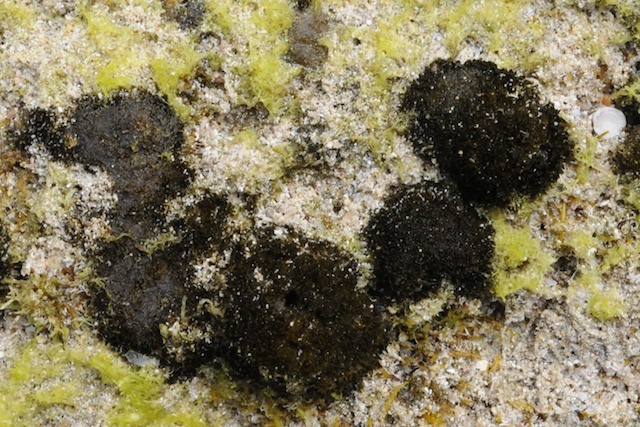 About 8% of lichens have the blue-green algal genus Nostoc as a partner. Individual blue-green algal cells are quite small and may be unicellular, but they are most commonly filamentous (lines of cells placed end to end) and they often are in colonies large enough to see. They have the distinction of being the oldest known fossils, more than 3.5 billion years old, in fact. It may surprise you then to know that the cyanobacteria are still ver much around; they are one of the largest and most important groups of bacteria on earth. 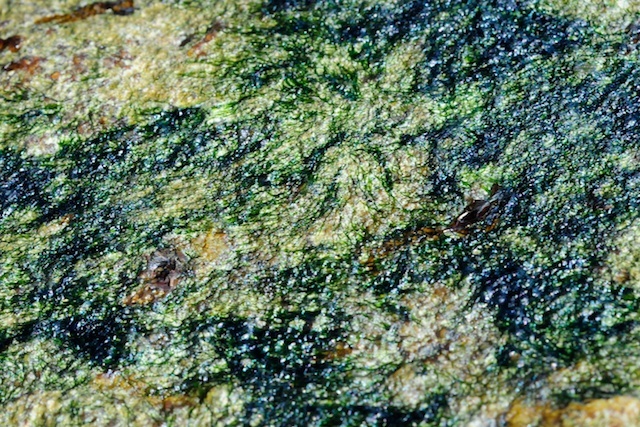 Blue green algae are very important intertidal organisms on tropical and subtropical reefs. Below are black patches of Lyngbya majuscula on Lord Howe Island, off Australia's east coast. This species can bloom to form huge floating masses in various parts of the world. Many Proterozoic oil deposits are thought to be due to the proliferation of cyanobacteria. Blue-green algae fix atmospheric nitrogen and they are also important providers of nitrogenous fertilizer in the cultivation of rice and beans. Blue-green algae have been tremendously important in shaping the course of evolution and ecological change throughout earth's history. The oxygen atmosphere that we depend on was probably generated by numerous cyanobacteria during the Archaean and Proterozoic Eras. Before that time, the atmosphere had a very different chemistry, quite unsuited to life as we know it today. The other great contribution of the cyanobacteria is the origin of plants. The chloroplast with which plants make food for themselves is actually a cyanobacterium living within the plant's cells. Sometime in the late Proterozoic, or in the early Cambrian, cyanobacteria began to take up residence other cells, making food for the host in return for a home. This event is one example of endosymbiosis, and s similar process was also the origin of the eukaryotic mitochondrion. Many blue-green algae produce toxins that can be dangerous to humans and to animals. Because they bloom in freshwater and marine habitats, they may cause mass mortalities of fish and other animals. Nuisance blue-green algae on paths and gardens. Site © M.D. Guiry 2000 - 2019. Important copyright notice: all text, design and photographs on this site are copyrighted by M.D. Guiry unless otherwise stated and all rights are strictly reserved. Click here for copyright information and contact. Website design: 249 Design Studio. Site maintained by M.D. Guiry (michael.guiry@nuigalway.ie). There have been 8724616 page loads since 1 January 2014 on 22 April 2019.